Motel room with one queen bed. Adults only. No children permitted. Motel room with two double beds. 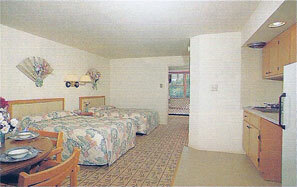 Two-room efficency suite with kitchenette, 2-burner stove, single sleep sofa, and two double beds. Two-room efficiency suite with kitchenette, microwave, single sleep sofa, and two double beds. Extra large efficiency suite with kitchenette, 2-burner stove, single sleep sofa, and two double beds. Please call us at (609) 884-0018 for reservations. We are a favorite spot for birding groups and have been hosting Cape May birders since 1988! Enjoy birding from the upper deck. We are happy to provide Cape May accommodations for birders visiting for the World Series of Birding, Cape May Autumn Birding Festival, and Cape MAYgration Spring Festival. 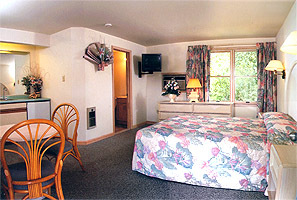 Cape Harbor Motor Inn is open Mid-April to November.